Pakistan’s devastating floods have opened up a Pandora’s Box of governance dysfunctions and historical distortions that have plagued the polity since independence. It remains to be seen what will be the outcome of the greatest calamity in our recent history. 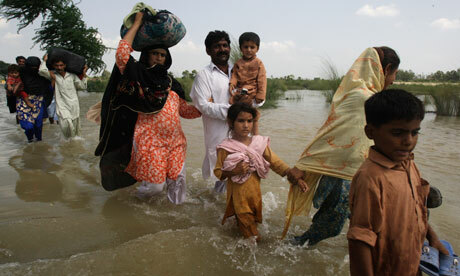 Various estimates show that the floods have affected 18-20 million people. The death toll has crossed the figure of 2000 while 2 million houses have been damaged or destroyed. Floodwaters are receding in many areas, and though there are concerns about standing water that remains in Punjab and other areas, the worst of the current flooding is taking place in Sindh. The disaster is still not over but the fissures within Pakistan have started to erupt and once again proving how vulnerable the state is and how fractured the Pakistani society has become. Five key crises have emerged, some old and some new. However, they point to the fact that our continuous refusal to address structural problems remains a key challenge. The colossal humanitarian tragedy and the imminent economic meltdown, will now shape a new Pakistan or rather, exacerbate its predicament in the months and years to come. Pakistan’s chronic political instability, structural economic constraints and a warped national security policy are all going to be affected by the unfolding drama of the national disaster, perhaps the severest, in the country’s history. Whilst the challenges have snowballed within a short duration of ten days, the response of the Pakistani state and society underline extremely dangerous trends and make us wonder about future of the country, as we have known it for the last 63 years. Pakistan had reverted to quasi-democratic rule after a decade of dictatorship in March 2008. Since the resumption of the electoral process in February 2008, the traditionally powerful unelected institutions, had acquired both legitimacy and unprecedented powers. The power troika of the 1990s had transformed into a quartet comprising the army, judiciary, the media and the civilian government which was represented by a ‘discredited’ president who has been a constant punching bag for the unelected institutions of the state.